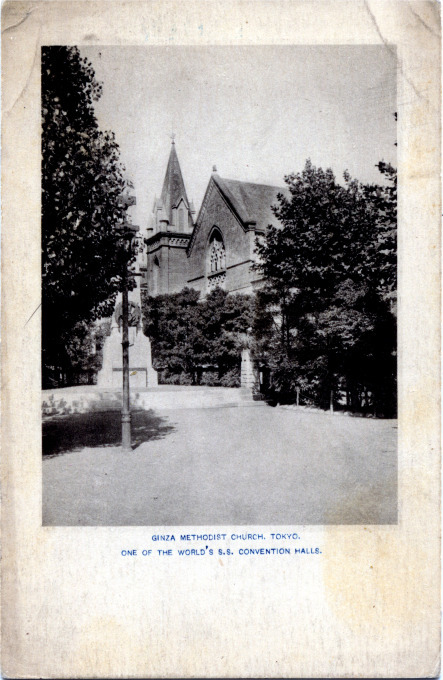 Ginza Tokyo Methodist Church, c. 1915. “A busy canal spanned by several bridges separates this part of Kojimachi Ward from Kyobashi and Nihonbashi, the most prominent of them the Sukiyabashi (‘tea room bridge’) so named from the circumstance that the district was formerly inhabited by retainers below the rank of samurai whose duty it was to perform the tea ceremony at the Court service. The region roundabout [Ginza] was the one-time hunting ground with falcons of the Shogun. Construction of Ginza Methodist Church was completed in 1912, overlooking the Sukiyabashi canal near Ginza Crossing on the present-day site of the Sukiyabashi Arcade and Shopping Center. For several years, the church was also home to the congregation of Tokyo Union Church. The Union Church pulpit was shared by various missionaries including by Dr. A.K. Reischauer, father of future Harvard professor and US Ambassador to Japan, Edwin O. Reischauer. The church was destroyed in the 1923 Great Kanto earthquake.